Fasting is the most ancient, inexpensive and powerful healing strategy known to mankind ­­ join Dr. David Jockers at The Fasting Transformation Summit to learn everything you need to know about this transformational health tactic! It’s an ancient healing practice that dates back to the beginning of mankind when our bodies were forced to adapt to times of famine and food scarcity on a regular basis. ­­It still costs nothing to practice and could transform the health of every cell in your body! Why I recommend joining in… Our ancestors once lived in a way that created robust health to help them survive the rigorous wear and tear of life. We’ve lost those life skills. Get Dr. David Jockers’ powerful, 40-page “Fasting Transformation Quickstart eGuide,” and learn how to use intermittent and extended fasting for improved health! >Most of us have heard of fasting — it’s been around since the beginning of human time for healing and spiritual purposes. But today, we live food abundance and we’ve lost this important skill. Fasting has incredible healing and body restorative benefits. In this guide, Dr. Jockers will break down the key terms, strategies and preparation steps to help you successfully transform your body, mind and spirit. In this 40-page eGuide, you’ll learn who should (and should not) fast, which type of fasting is best for you, health benefits that can be gained from fasting, answers to most common questions and more! And, be sure to join me on January 14th for the start of the free, online Fasting Transformation Summit — over 25 experts empowering you to live with a stronger, more powerful edge in life. P.S. Don’t miss out on Dr. Jockers’ powerful, 40-page “Fasting Transformation Quickstart eGuide” when you click the green button below. Today, more and more people are struggling with their weight, chronic pain, memory loss, digestive problems, cancer, and autoimmune diseases. And more! Dr. David Jockers has interviewed experts from around the world who specialize in the research and application of the fasting lifestyle. In fact, Dr. Jockers himself used fasting to help overcome IBS and skin cancer. He’s here to share that wisdom with you! There can be great benefits to confining the time window in which you consume your calories each day, however many misconceptions exist. >So, let’s dispel the most common fasting myths so you can feel more comfortable using this powerful health strategy in your daily life! [BTW, if you REALLY want to learn about fasting, join me for Dr. David Jockers’ Fasting Transformation Summit by registering for free now! 1. Fasting is unnatural and unhealthy Intermittent fasting actually seems to have an overall healing effect on the body by stimulating repair and protection mechanisms. 2. Fasting slows down your metabolism Research shows that intermittent fasting can have a metabolism boosting effect as it promotes a state of ketosis and increases growth hormone levels. 3. Fasting causes nutrient deficiencies Of all the intermittent fasting myths, this is one of the most unfounded. When you fast, you use up significantly less nutrients and are able to retain them for future use. 4. Fasting causes muscle loss A recent study showed that alternate-day fasting for a period of 8 weeks stimulated fat loss on average of 12 lbs while there was no significant loss in muscle mass. 5. Fasting causes eating disorders It’s not likely that intermittent fasting would cause an eating disorder. However, it *is* possible that a dietary strategy aimed at promoting weight loss would attract those who already struggle with eating disorders. Ready to learn more about fasting? Join me at Dr. Jockers’ Fasting Transformation Summit! Not eating for a period of time can be very therapeutic for your body. In fact, intermittent fasting boosts the immune system, stimulates the clean-up and recycling of old damaged cells, improves DNA repair, improves insulin sensitivity and helps to protect you against a number of different diseases. Hope to see you at this iconic event! Fasting costs nothing to practice and could transform the health of every cell in your body! 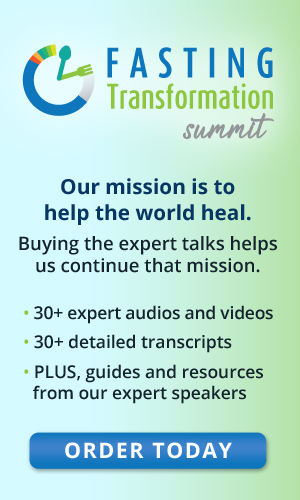 Register for The Fasting Transformation Summit to learn more about this health strategy! Use the green buttons anywhere on this page to register for free.